Veteran stopper still on manager’s mind. 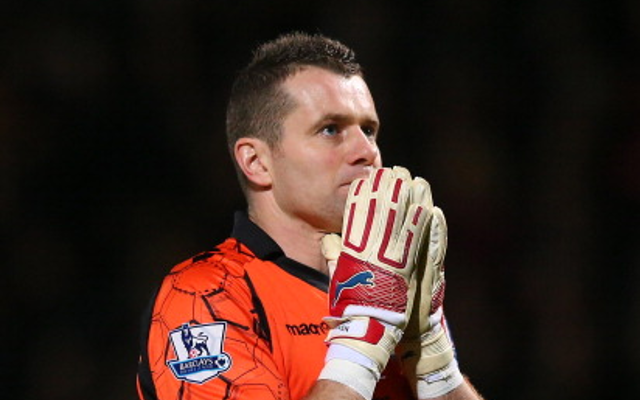 Liverpool manager Brendan Rodgers is set to make a return for Aston Villa goalkeeper Shay Given during the January transfer window, according to ClubCall. The former Republic of Ireland intentional has now been relegated to third choice under Paul Lambert after initially being kept on the bench last season thanks to the impressive form of ex-understudy Brad Guzan. At 37-year-old Given is eager to move on and grab an opportunity elsewhere before the game slips by him for good and Rodgers is thought to be considering throwing him a lifeline. Rodgers had been interested in the former Newcastle man in the summer but failed to follow up his initial interest with a formal bid and will now return with a more concrete bid in an attempt to provide some experienced cover for Simon Mignolet. However, Liverpool only recently offered a new contract extension to current number two Brad Jones, and with two-and-a-half years remaining on his deal in the West Midlands he may prove slightly difficult to bring on board. Given also came close to joining Doncaster Rovers over the summer but the move was scuppered when the Championship side were taken over by a new consortium.